When it comes to painting toy soldiers, it might seem odd to say you learn more from your failures than your successes, but it's true. I know that I've learned more from the things I've messed up than the things I've managed to get right. It took an email conversation I was having with Bear over Generic 40k Blog to bring this to my attention. 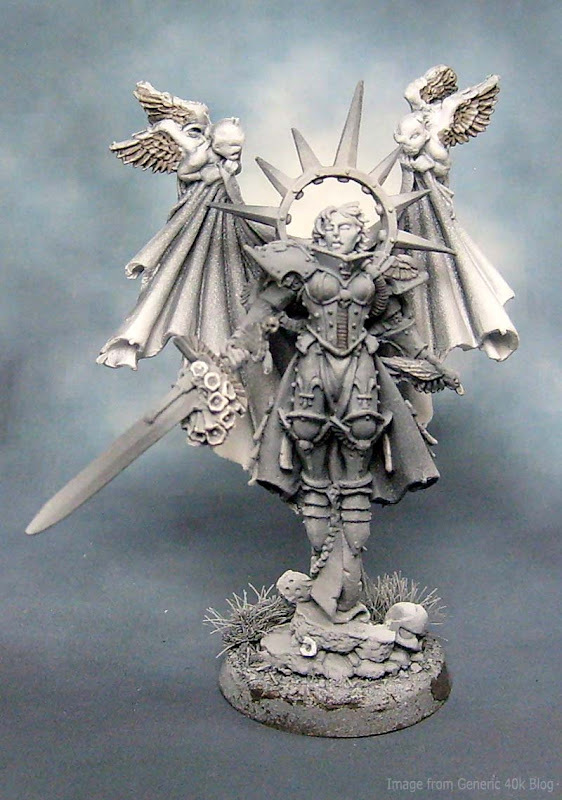 He's been working on a Celestine model (the one seen above) and he's been going back and forth about how to do it and whether or not to try and match his current scheme and so and so forth. The model has been a struggle for him to say the least. But he's come out of it with one thing more than anything else. A great understanding of how to apply lights and darks to a model. It doesn't matter if it matches his army or if he ends up stripping the paint off and repainting it in the end. He's learned something that will carry over into the rest of his painting from this point on. And then I got to thinking, what's come out of the failures I've had? This was one of my first attempts at applying directional light source to a model. Sure, I might have started with a basic understanding of the concepts in general, but actually applying it to a model is another story all together. Some things work and some just don't. Putting paint on a model shows you that real quick. Trying to get the blending smooth enough and the contrast correct so that it looks like the model is being "lit" by the source light is a challenge. Working through that model and others allowed me to apply all that I'd learned to paint this Terminator Librarian here. With zenithal highlighting being a very specific way of highlighting, it can be tough to get it right the first time around. An even bigger failure that turned into a success for me was this one here. While this one wasn't a complete and utter failure, it did help pave the way for the more refined approach that lead to the method I like to use now. This first method is quick and dirty. It's not very refined and the overall results show that. Will it work for a very fast paint job... sure, but it needs help. This is what came out of that. After working on the process over and over until I worked through all the smaller issues and bugs, I reached a point where the end result is much nicer, cleaner and finished looking. Of course it takes much longer, but that's part of the process. Had I given up after any of those first models, I wouldn't have the experience I have today. 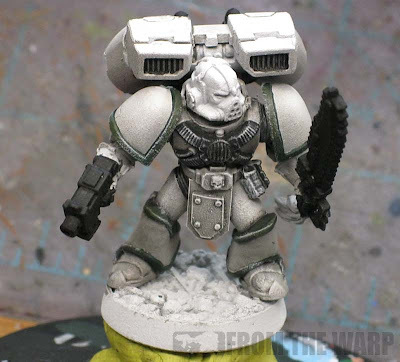 I wouldn't have a great way to paint Deathwing or a solid understanding of how to paint a model using a zenithal approach. And the list goes on... painting white, using decals, how to paint black armour and so on. Just because your first attempt doesn't go as you wanted, don't scrap your model just yet. Nothing says you have to post your spectacular failures on your blog or in a forum, but you should at least look at what you can take away from the process. Maybe you invested a hundred hours in the model only to have it come out "wrong." But I'm willing to bet you learned a thing or two in those hundred hours. Something you can use next time and build on it. And that's the trick, trying new things, building on what you learn and finding your way when it comes to painting. 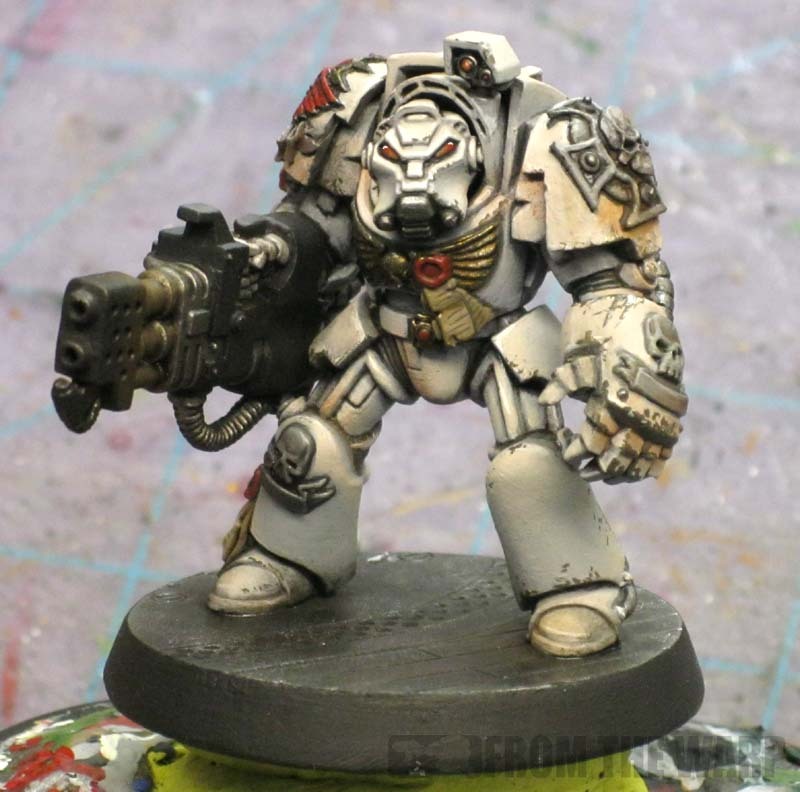 UPDATED: I've added this pic of the Pre-Heresy World Eater marine before he was painted that way. He was supposed to be a Death Guard Assault Marine but I messed up his painting horribly. I was trying to use a light grey primer and blend it to white using a zenithal type approach, but I failed miserably. I kept at it until I reached a point that I just could not save him. He just looked too bad. That's when I started over. While I didn't finish the model, it taught me a lot about trying to work through things and how to solve them. Do you have a painting style or do you struggle like I do? As I tell my Taekwondo students, the easiest way to never make a mistake is to never try anything. Mistakes are how we learn. Great article as usual, Ron. I couldn't agree more. Just the other day I had one such example. Painted a power sword and thought I had done well with it initially. A bit later I wasn't so sold on my power sword technique and went into the shop to play. I was showing another player my completed unit, including power sword wielding dude, and he said, "The unit looks good except for this power sword." It was honesty that I was expecting when I showed him the unit and he confirmed what I suspected. So now it's time to work on the technique more and to try again. Exactly, and this is something that applies to life in general - ask entrepreneurs about failures that preceded their success. Paint/hobby is just the same, practice makes perfect. Agreed, try new things and you will learn a lot from building on that experience. I know experimenting with OSL, wet blending, and hard edging I have really expanded what my current force is. I picked up a paint brush for the first time in about a year. I have so many models and ideas, I just thought if I can just commit to trying to working a single model every night or two I can get through my army and finally have it finished. Now I'm not a great painter but ther result after that first night still wasn't as good as I had hoped. This article was perfect for me to read. I can't get discouraged and tonight when I work on my next guy, I have to know that it will be a better result. Thank you for another inspiring article. This keeps me motivated and inspired to try new things. 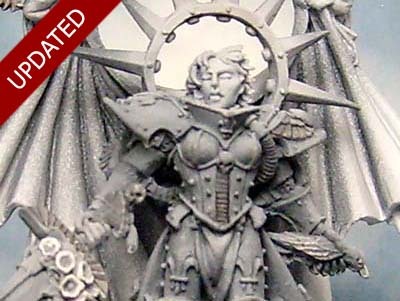 Coincidentally enough, I've spent this entire last week working on my Celestine. I've usually worked on models a bit a time, alternating between 10 or so pieces but I decided to focus on a single one and really test myself and see how my painting had evolved (1 yr anniversary of getting into 40k next week). My Black Reach Warboss was my first complete piece, nothing fancy but it showed everything I'd learned in the first 4 months I'd been painting. Celestine is meant to be my one year marker, using my new techniques and knowledge. 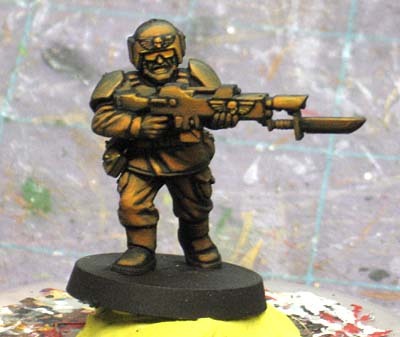 I have a sister superior with a crossbow/boltgun (Condemnor) and the worst face ever painted. That taught me how to control my washes and with faces, less can be more. Also taught me how a minor little conversion (filed down fantasy crossbow glued under the gun) can make a model feel really unique. on a serious note, great arcticle Ron. I think it will help aspiring painters a lot, a lot of good folks put down the brush after a few unhappy results. It's nice to know this post hits home with some folks. I post more of my "finished" work here along with the occasional WIP, but everything is set up so that you all get the most from in terms of looks since it's often for a tutorial. If you all knew the amount of stuff I messed up, threw away, took pictures of and never posted, you'd be amazed. It's just practice and more practice and keeping at it until you get something you like... or in my case, something I can show you all so you can see what it looks like done. I'm glad this pushes folks to keep at it. I use that saying when I'm training new hires. I tell them, "We learn more from our mistakes than we do our accomplishments." so that they know it's okay to make errors and to try new ways of doing things. It's only natural to want to constantly succeed but if we don't try new things we never achieve some of our happy accidents. I love my failures, especially when I can put them side by side with my successes. My biggest error is not finishing up and moving on to the next one...I usually have about 5 models at a time, halfway done, waiting to be finished. It's really best to focus from time to time and then move on to the next one...there's always going to be another one to paint! But that's the thing about this hobby: the joy is in the pursuit of the idea, not just the achievement! 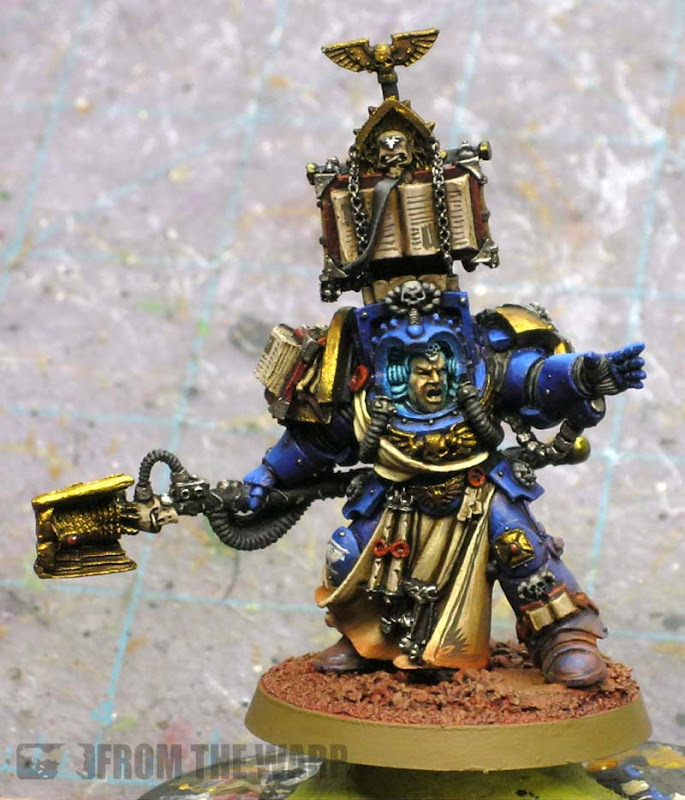 I've updated the post and added a pic of the World Eater marine before he was a World Eater. He was supposed to be Death Guard, but I messed it up horribly. 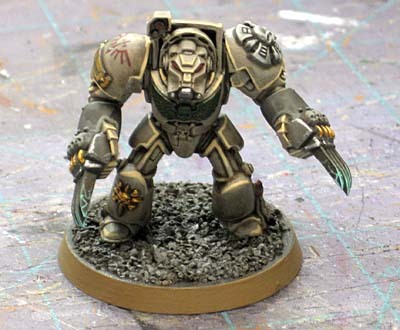 Anyone else think that the Pre heresy world eater marine looks like Bane from dark knight rises? Jack: I had to google it, but I see what you mean know. Col: Thanks, lots of work this weekend cleaning up since the majority of the work is done now. Time to put it all back together. this is a great point Ron well made, I have failed massive on a few models but when you get that YES moment and when it works its an awesome feeling. Dunk: The YES moment is a good way of explaining it. If you can capture that, the final outcome doesn't really matter then.